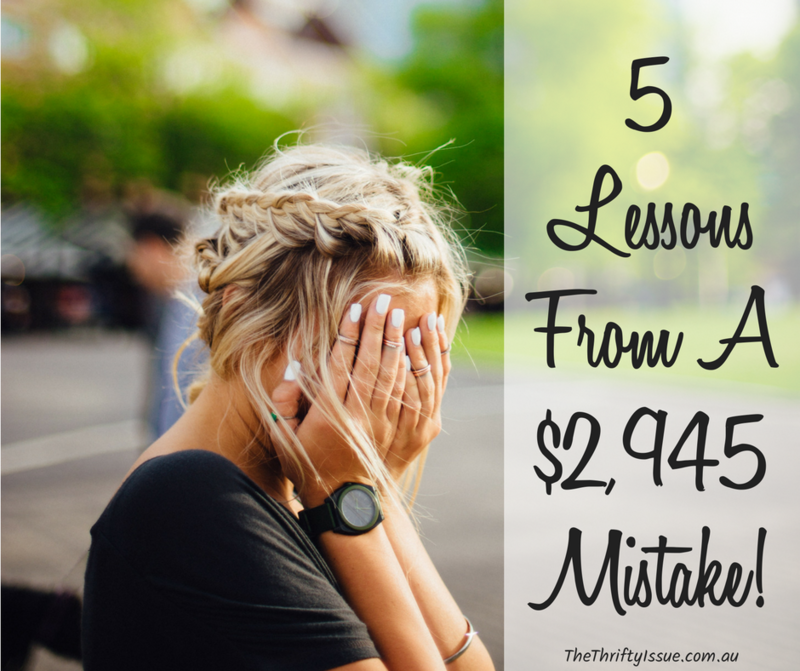 How to recover from a big financial mistake! Despite great planning, mistakes or ‘bad luck’ happen. We had a doozy of a mistake, or rather a string of issues outside our control between December 23rd and January 1st resulting in $2,945 of unexpected expenses. *Disclosure – some affiliate links are used in posts. Without going into details, our ‘free’ holiday to see friends and family which was covered by renting my place on Airbnb ended up costing $2,945! A hotel was used on 4 nights, extra attractions and 2 extra locations visited and the budget was blown. While dropping $2,945 on unexpected expenses is not ideal (and certainly not affordable for many), I learnt a few major lessons and here they are. In the end, money is not limited, we can always make more. Airbnb income was worth $1,281.56 for the 5 days two separate guests stayed. Doing some extra travel provided opportunities to pitch for consulting work, freelance writing and a few other things. We also came across an old coin collection which I now get to sell! So that was a bonus. When a financial hurdle strikes, look at how you can make more money. Can you sell anything, take on extra work such as cleaning, babysitting, ironing or any of these 51 ideas for making money at home. Also look at how you can cut back. Try the 21-day money challenge to get started. This time period saw me waste too much time with sorting out Airbnb stuff, getting the car and similar things. While I did make money with Airbnb and the car was cheaper than a rental from a company, the time I spent on sorting all this out added up. Being unable to work on my business during this time meant I possibly lost more money than I saved. When weighing up financial choices, look at how much time something will take and what other opportunities you are saying no. Trying to save money can sometimes cost you more than you intended. December 22nd and 23rd I wanted to pull out of the travel plans, cancel the Airbnb and stay home. Instead, I pushed through to see family as that was what I felt was expected. Next year, I better be either on a cruise, having a white Christmas or doing nothing at home! Even though I read “The Life-Changing Magic Of Not Giving a F*ck” by Sarah Knight last year, I still felt some pressure. Going on this trip and the shenanigans that happened to cause the massive blow out solidified my resolve to do what is best for my daughters and I. Every other area of my life I am solid on this, yet when it comes to Christmas, I falter. Whatever happens, it’s your life and your money. You don’t have to do what others expect or demand. Take a few deep breathes, visualise what you want and get out if needed. When surrounded by a less than ideal situation, we went for a drive, played some music, chatted and it was then that clarity hit like a lightning bolt. It was because of everything going on that I was able to see clearly what I wanted. I don’t think that would have happened if everything went smoothly. One thing we wanted was to be able to switch off and get clear on how we wanted things to be in 2018. After receiving an official ASD (Autism Spectrum Disorder) for my eldest, being recommended to have my 8-year-old assessed and having our child custody bumped to a higher court, we were spent. My daughters and I knew things needed to change and we wanted to have time to think, then implement it. With so many hiccups, I was unsure I’d be able to get clear on what we need. By 27th Dec I knew what I wanted, how to do their room to suit them the best, how to change the bedtime routine and everything else. We discussed it all and got really clear on it. Despite the stress and mess, we got clear. Personally, I wanted the time to get clarity on my business, marketing, what I wanted to continue and what I wanted to drop. Which goals were relevant for me for 2018 and what would be my priorities. Surprisingly, it was while driving between locations that clarity really hit. To my kids, the Christmas break was amazing! They got to see family, stay in a few hotels, go mining (which is something my 8yr old has wanted for ages), swimming at a river and more. We discovered new places we wouldn’t have gone before and overall it was a great time. As much as the financial element sucked, the kids had a blast and we made some wonderful memories. When your finances are going to hell, try not to let your kids feel the stress. Let them enjoy their childhood. I had no idea as a kid my parents didn’t have a lot of money at the time, but I did have a brilliant childhood. – One night staying up late, just us, cooking (well, burning) sausages in the firepit plate and talking about what we wanted for the year. These 3 things involved just us and wouldn’t have happened if we didn’t make them happen. What should you do if you hit a financial snag? Firstly, acknowledge it and add up the total amount so you know what you are facing. Once you know, go over what happened and what you can learn from it. While financial mistakes and issues aren’t ideal, we can learn a lot from them. Once you know exactly how much you overspent or how much it all costs, create a plan of action. With my example, after taking out the money for Airbnb, it’s $1,663.44 I need to find to replenish the savings used. Considering most of us cash out our points from online surveys or reward programs at Christmas, there isn’t much wiggle room there. – Taking on extra work such as cleaning, babysitting, Airtasker jobs or things posted on Gumtree. – Selling off things you own. I made over $10,000 in a month doing this last year. – Pitching articles if you are a good writer. Depending on where you pitch, how you write and what you provide you can get between $50 and $500 from most sites. Larger sites or media pay more for professional writers too. – Look for other ways to make extra money. What money mistake have you made lately and what did you learn from it? No one is above mistakes. The most important thing is that, we should learn from our mistakes. Also, it is good to learn from other people’s mistakes so that we don’t fall into the pit too. Great tips! Yes, costs add up so quick when we go out of town, even if it’s just to visit family. It sounds like you have a great sense of balance about it, and at least there will be those great memories for the kids. Thank you! We usually get paid to travel, so this was a bit of a blow, haha. But so worth it. Love this post. Anything that you learn from is not a mistake, it’s a life experience 😀 Thanks for sharing your ideas! I can appreciate your advice of acknowledging the mistake. I like to pretend it never happened and not really face my actions. Denial is one hell of a drug! Denial is often an attractive option short term.